The small town of Minde goes from being an average middle American hometown to one torn apart by fear and suspicion as an unknown threat makes itself felt. It all begins with the disappearance of Benny Jorgens, who reappears a few days later, a completely ruined form of life. His mind has been torn from his body, and he must enter the subconscious realm of human thought to find a way to regain control, before the madman who stole everything from him can use his body to kill everyone Benny holds dear. Let the Ravaging Begin. Small Town Ravaging has not been tagged yet. Help others find Small Town Ravaging by tagging it! 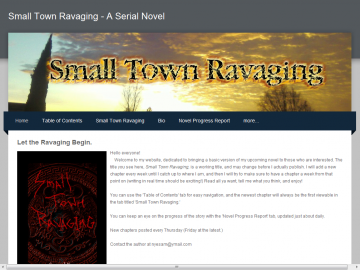 Small Town Ravaging has not been reviewed yet. Small Town Ravaging has not been recommended yet.